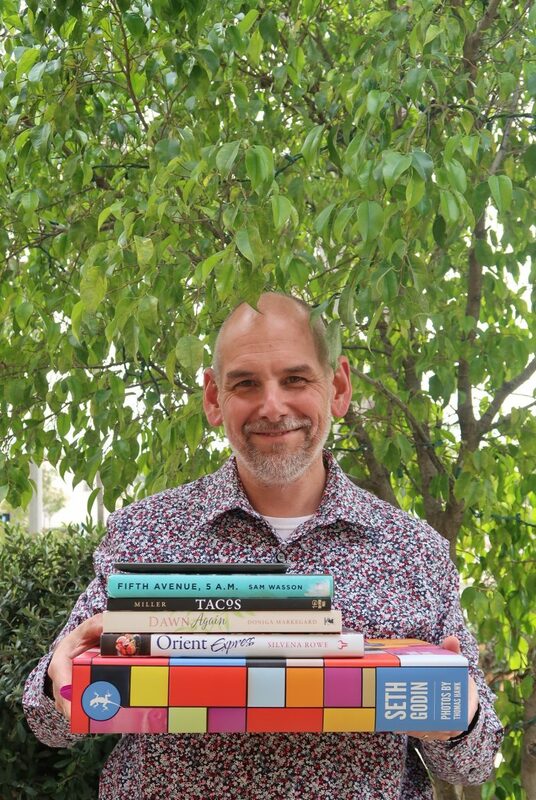 As a company of book lovers, we equate any change in the season with an opportunity to talk about the books we are reading, planning to read, or have recently read. Here in the northern hemisphere, spring is springing, bringing days of longer light, chirpier birds, and a feeling of excitement about the coming weeks and months of warmer weather and beach days. 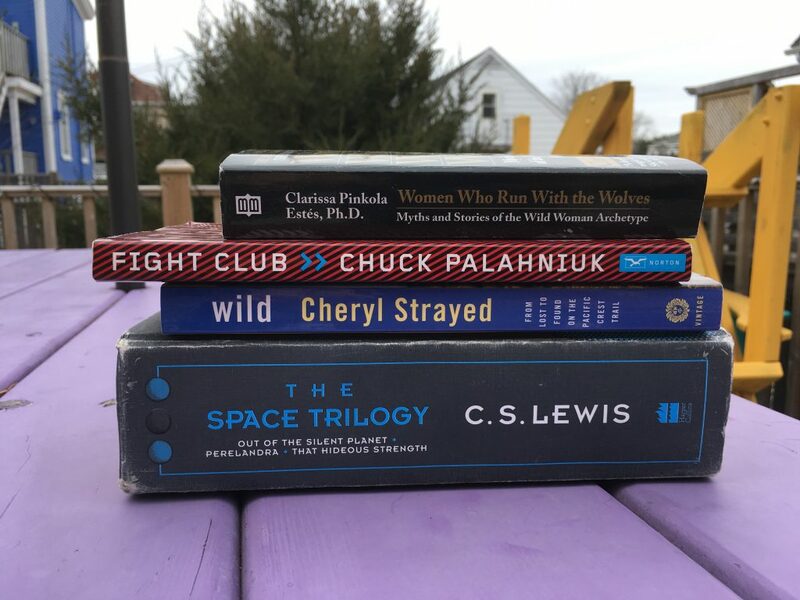 For me, any spring read is one I can take out into the garden with me, but since I live on the east coast of Canada, and spring is being quite pokey this year, I have to content myself with reading near a big window, supervising the slow melting of the snow that currently covers my garden. To that end, there are a couple of old gardening books my parents, both avid gardeners, passed down to me. I page through them every early spring, dreaming of getting my hands dirty when the big melt finally comes. I’m also digging in to Baseball Life Advice by Stacey May Fowles as that season once again heats up. And lately I’m finding I really want to prioritize the voices of women. To that end, Penelope by Sue Goyette always has a place on my shelf, as does anything by Alice Munro, in this case the amazing Hateship, Friendship, Courtship, Loveship, Marriage. And I’m loving dipping into Startle and Illuminate, a book of writing advice from Carol Shields. Rounding out this stack are reference books that feel luxurious. I want to eat everything that Deb Perelman cooks, so I love reading—and cooking from—her book Smitten Kitchen Every Day. The Hidden Lives of Trees I am slowly making my way through, a pace I’ll likely pick up as the leaves return outside my windows. And then there is Lists of Note, a perfectly odd compendium of lists by people like Sylvia Plath and Jack Kerouac, Edith Wharton and Captain Beefheart. As a lifelong lover of lists of all kinds, I am infatuated with this book. The thing about lists is that they can reveal much more than mundane details—everything from love to grief, to writing advice, to notes on how to be a good person are detailed here. And finally, an Italian translation of The Little Prince, by Antoine de Saint-Exupery. I don’t read this one so much as dream of being able to read it. Still, I like to open it and practice my pronunciation and challenge my comprehension. What are “spring reads”? To me they are those books that are grounded in the season OR they are books that help you do some deep cleaning. I read Animal Vegetable Miracle every year as I try to remind myself why I want to get out in the garden. 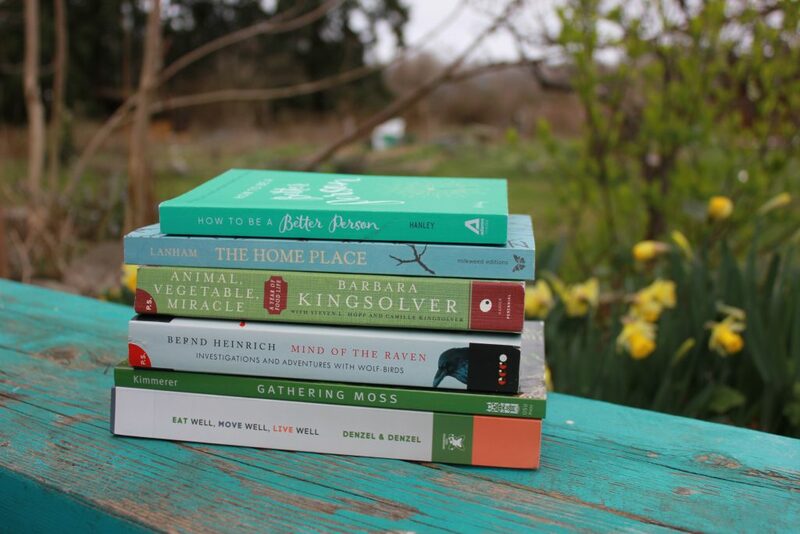 Gathering Moss, Mind of the Raven, and The Home Place are books about an aspect of the natural world—and spring is where you’ll find me watching more birds, sitting on bare earth trying to pick things apart with my hands and eyes. Eat Well Move Well Live Well—while this is “52 Weeks of” book, I’m going to pick just a couple small chapters (“Fermenting” and “I Have Needs,” if you must know) and make that part of tidying house. Along those same lines, How to be a Better Person is like Spring Cleaning for my soul. “400+ ways to make a difference in yourself—and the world”, and I seem to need reminders for about 395 of them! That big book is by Seth Godin, and it’s called What does it sound like when you change your mind? It got it when I attended one of Seth’s talks. It’s really heavy. Fifteen pounds, and because I didn’t know I was going to get it, walked to his talk. That meant I had to walk back. With the book. A couple of miles. That, my friends, is nutritious movement. The perfect spring workout. By the way, the book is so big and heavy that we put if on a book stand like it’s the Bible or a unabridged dictionary. We read it every day. It’s all kinds of big. Next up is Orient Express, by Silvena Rowe. It’s our second cookbook of hers. It’s like if Mediterranean and Bulgarian cuisine had a love child that was extremely photogenic. Totally worth it. The book is filled with amazing fresh vegetables and vibrant spring colors that will probably look brown on Instagram. Dawn Again was hidden on my wife’s side of the bed, and our ‘spring clean’ brought it forward, so now I can finish it. Good timing, because there so much about the outdoors in there. Spring is the perfect time for the inspiration. Tacos, by Mark Miller. This gift from Galina has an amazing recipe for Tacos Al Pastor. I love everything about tacos, Galina, and al pastor. Fifth Avenue, 5 a.m., by Sam Wasson. This is all about Breakfast at Tiffany’s. The making of, the angst of, Audrey, Truman, Fred. All of it. In Truman Capote’s book, Holly is a prostitute, and I’m reading this book and I’m like “OMG, I was so blind…” How embarrassing.THEN… we watched again, and I wasn’t blind. Holly is not a prostitute in the movie at all. They made her a ‘society girl’ or something like that. Something that doesn’t really exist, like the fun, jazzy cocktail parties that we wish actually went on all the time in the early ’60s. I’ll probably watch it again soon. I love that movie. That thing on the top is my kindle. That’s where I keep most of my science fiction and vampire stories. Vampires prefer winter, so for spring, I’ll be focusing on the stars. Debbie Beane keeps the wheels moving at our sister company Nutritious Movement, but she’s just as big a word nerd as the rest of us. 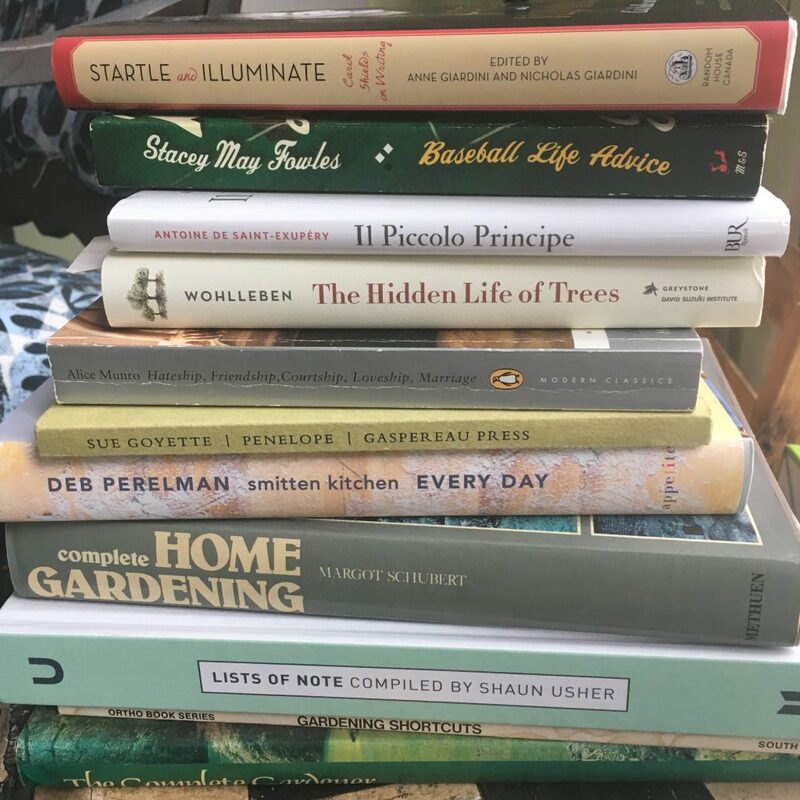 All of my books right now are centered around growing and exploring, which are often put on hold as the snow piles up around here. We’re still waiting for it to melt (to stop falling, really) so some vicarious living through books is in order. Words for the Wild is my trail-side inspiration, and I’m re-visiting the essays with my kids as we get closer to backpacking season. Closer to the Ground is one I’ve been meaning to read for over a year now, but it starts in the spring (or rather, as the author is Ready For Spring To Start), so now’s the time to begin. California Field Atlas: exploring my home state anew with this beautiful inspiration to travel and be outside. Robbing the Bees is a cool history of humans and honey, as I try to decide whether this is the year we try again with bees. The Earth Speaks is a childhood friend, also re-reading with my kids. 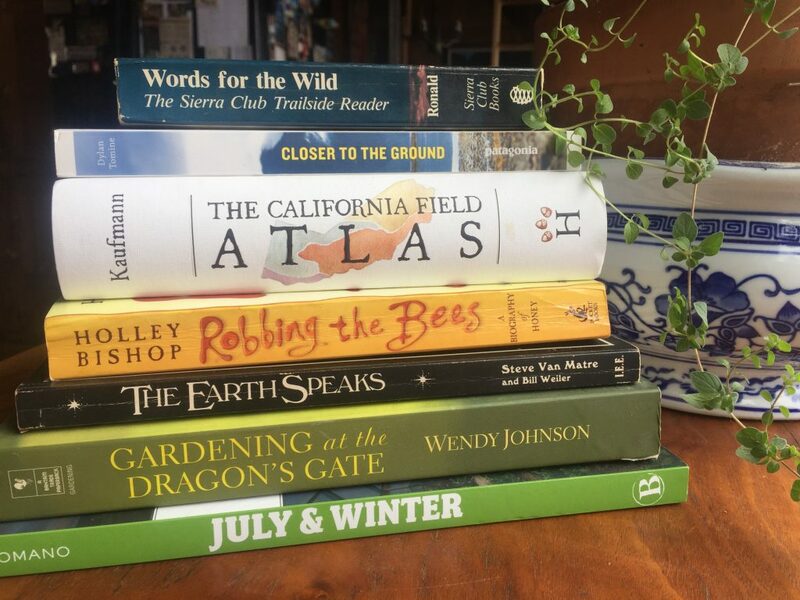 Gardening at the Dragon’s Gate is about gardening both the earth and the mind, apropos of spring, and July and Winter is to help me figure out how to grow more than just lettuce and peas in my short Tahoe growing season. My spring reads are the books that point me back to what is wanting to be born or be renewed. Right now, my spring reading shelfie looks like this: Blue Horses by Mary Oliver and The Chaos of Longing by k.y. Robinson—I read and write poetry, and the more writing wants to emerge, the more I find inspiration and company in poetry. There is a discipline in being available to the writing that wants to happen and reading others’ poetry helps me stay open to it. The Book of Awakening by Mark Nepo, as there are beautiful daily encouragements to keep looking out, yet staying connected to looking in. Belonging by Toko-pa Turner is one of the most moving reads I’ve held in a while, and invites us to embrace our deepest nature, and re-remember the skill of belonging and find our way back, both rooted and free. The archetypes in the book, like spring, are eternal and repeating, and invite what is eternal in me to show up. Standout 2.0 is my reminder that I have practical strengths in the world, and is a great teacher in how to show up at work and in the marketplace, with ease and grace, showing my greatest talents. It’s very affirming and has been a great professional companion for me and our work online. 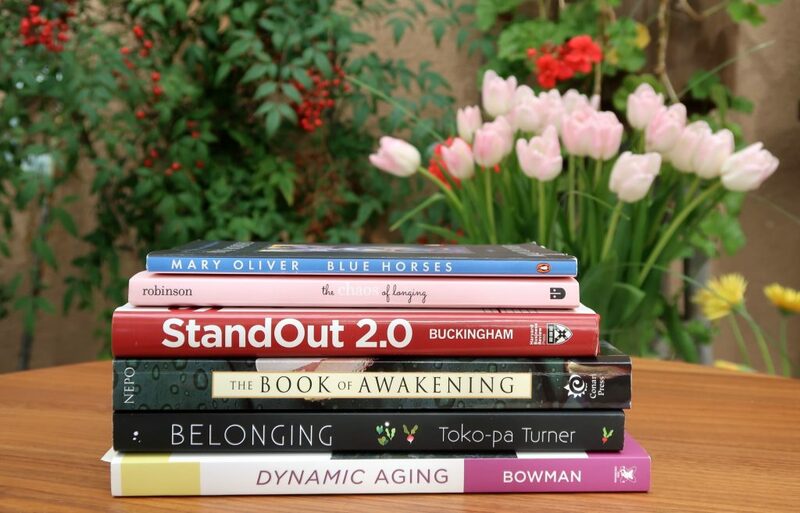 And last, but not least, I am re-reading Dynamic Aging—as I have committed myself to support my goldener students and create a local book club for them. I am inspired by the stories and women in the book and am preparing to pass on the spirit of Dynamic Aging—if there is a message of continuous renewal and hope through movement, this book is it. My reading this spring is Rick Steves’ Portuguese Phrase Book and Dictionary + his Portugal. Fado music is in my immediate future as my brother and I are backpacking (and driving) around Portugal for 30 days. My most common phrase will be Fala ingles? or Do you speak English? Spring is a time of expansion and movement, and these are all titles, that to me, explore pushing the edges of our current realities. Be it against our social and mental constructs (Fight Club), our gendered boundaries (Women Who Run with the Wolves), our own natural settings and movement (Wild) or the fantastical explorations of the imagination (The Space Trilogy), I love how spring creates new growth and fresh possibilities. What about you? Are there books to which you return each spring? Or is there a stack of new-to-you reads just waiting for your attention? Drop us a line in the comments and let us know!